To celebrate a birthday, Amanda and several of her class friends, neighbors, and family members gathered together for a fun, color filled art party. The afternoon began with hand-prints on a personal birthday canvas. Then all the kids gathered around for a simple art instruction based on a pumpkin and fall colored still life. They then were allowed to pick something from the inspiration table to take with them to their art station. Some chose to sit, others preferred to stand,... and the young ones were at a small work table where I could oversee and give help when needed. 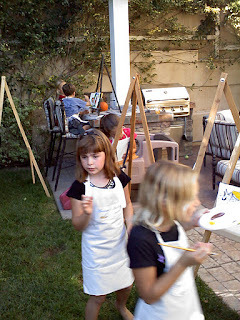 The kids were given personalized aprons & created wonderful paintings. Later, when the parents returned, they were treated to an art gallery (set up around the house) with tags to identify the works of art. Some of the parents chose to grab a canvas and give creativity a change to grow in them too... it was wonderful to see parents and children working together, and SMILING!!! YOUR PARTY COULD BE THE NEXT BIG THING!! !